Big City Gardener creates edible raised bed or in ground gardens that provide bountiful harvests of produce and flowers. Big City Gardener can turn your outdoor space, into a rewarding and abundant garden. Since every garden space is different, the design phase begins with an onsite visit where I will assess lighting, water availability, site location, and client preferences. From the information obtained a customized plan and proposal for your space will be designed to fit your needs. The completed design project proposal will include: the landscape plans, plant list, & a scope of work document- that will detail the specifications and steps necessary for the landscape installation. BCG works with our clients from start to finish, providing a complete service experience. We understand, that when investing in landscaping you want it to not only look amazing, but to be built with the highest quality craftsmanship. Using professional and proper techniques we ensure that your new garden space will have lasting beauty. Onsite and online consulting is available. 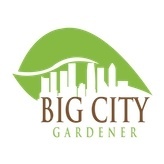 As a garden coach, Big City Gardener wants to help you save time, labor, and shorten the learning curve by helping you make informed decisions about plants, soil, tools, and fertilizers. Customized coaching programs may consist of a single session or evolve into a program of lifelong learning through ongoing coaching sessions. Each program is customized to fit the skills, needs, interests, and budgets of the individual client. Our goal is to helps clients to become productive and efficient gardeners through educating and hands on experiences. After each visit a detailed report will be sent to you including before and after pictures, photos of your harvest, notes and future plans. This is especially beneficial for restaurants who want to join the farm to table revolution that is sweeping the industry.